Is Your Attitude Losing Altitude? Did you know that you can stay positive virtually all the time? It’s a choice. But what if you expect good and don’t always get the outcome you’re hoping for? Well, if you expect the worst, you won’t always get the desired results either. Choosing the brighter outlook produces time spent cheerful and happy instead of downtrodden by gloomy predictions. Doesn’t that make sense? Positivism is the food of happiness. And happiness and joy are the fuel for effectiveness in love and work. Joy and pleasure promote both mental and physical health, but pleasure is not an end goal. We need pleasure and fun in our lives but can be deeply satisfied when we have mastery and purpose in productivity, love and knowledge. I get much joy in the process of helping clients not only get better but well through helping them separate their goals and intentions from what others’ might wish and find their motivation for achieving what they truly wish. Communication is key. Passivity in expressing wants and needs can de-rail any relationship – business or personal. But expression needs to be positive, caring and tactful if your objective is peace not war; productivity not self-indulgence. Yelling is only necessary if someone is in imminent danger. I am trained in client-centered interactive cognitive, relational and behavioral therapy. I am fortunate to have post graduate training with Laura Perls, co-founder of Gestalt therapy and Albert Ellis, founder of Rational Emotive Therapy. Dr. Page offers personalized therapy for individuals, couples, families and groups. Phone, Secure Video, FaceTime or Skype sessions are available. Dr. 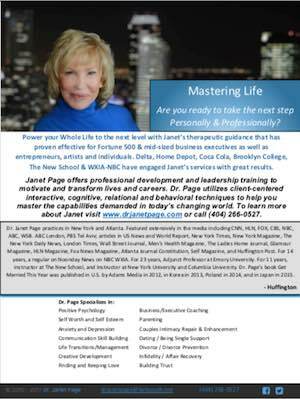 Page is available for workshops in person or via phone, Secure Video, FaceTime or Skype. Assess the past for a brighter future. The long road makes arrival that much sweeter. “The book's message is … no manipulation, no games. Just a plan to take an honest look at yourself. 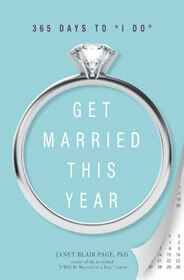 to “I Do” throw you off of this book. quick read and offers plenty of good advice."